BUFFALO, N.Y. – December 28, 2012 – Mokon’s line of Duratherm circulating water temperature control systems has been expanded to now include Duratherm MAX a line of high performance water systems with temperatures up to 380°F (193°C) and system pressures up to 300 PSI. Duratherm MAX is ideal for restrictive processes and high temperature water applications. This Duratherm design features a stainless steel heater vessel that is designed and tested to ASME standards. The system utilizes nonferrous and stainless steel materials of construction and a seal-less magnetic drive turbine pump fitted with a stainless steel impeller. The Duratherm MAX incorporates a unique fan-cooled heat exchanger that provides safe and dependable cooling of the process fluid and eliminates thermal shock, flashing to steam, mineral buildup and expansion noise. ABOUT MOKON – For over 55 years, Mokon has set the standard for high quality circulating liquid temperature control systems. Through the development of new products, refinement of existing designs, and our ability to create custom engineered solutions, Mokon has consistently demonstrated its ability to foresee the evolving needs of customers in plastics, packaging, converting, composites, food processing, pharmaceutical, chemical processing, rubber, printing, general processing and many more industries. The company’s product line has grown significantly since it first introduced a water temperature control system in 1955 to include heat transfer oil systems, portable and central chillers, pump tanks, cooling towers, blown film coolers, cold climate coolers, engineered and pre-engineered control panels, maintenance products and custom designed/engineered systems. 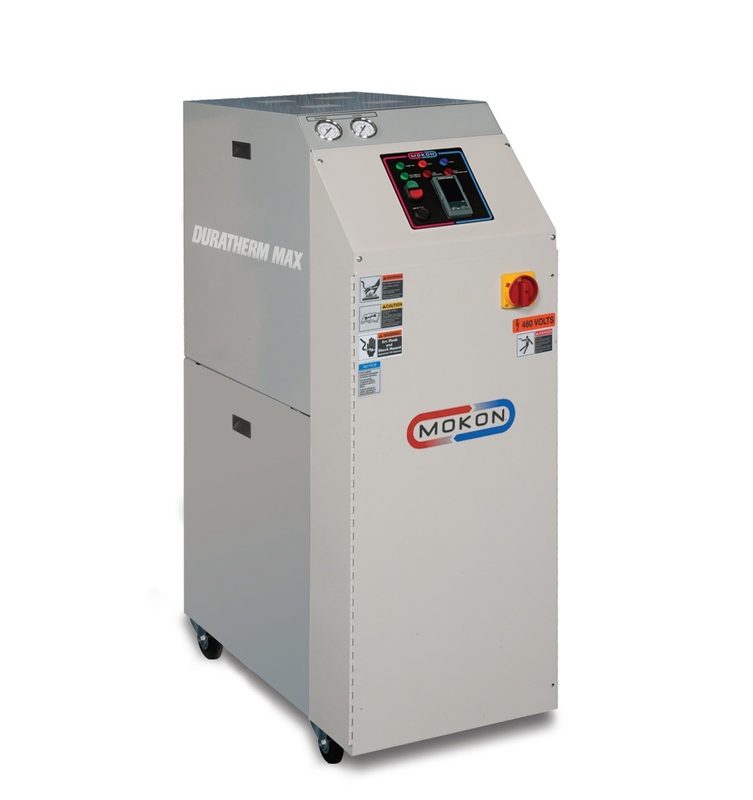 Mokon’s circulating liquid heating and chilling equipment is proudly designed and manufactured in the USA.